So last night I go and catch the dress rehearsal of Nickel City Opera's production of Donizetti's "Don Pasquale." It is full of lovely melodies. 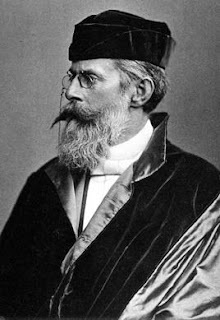 I drive home listening to the songs of Heinrich von Herzogenberg. He is this German Romantic composer I did not think I would like but to my surprise a lot of these songs are gorgeous. That is old Herr von Herzogenberg pictured above. All this beautiful music! So when I wake up today, what is on my brain? "Ooh la la, ooh la la, ooh la la, ooh la la ...."
Recently I have thought, I have to go out of my way to seek out beautiful things, to fill my mind with beauty and not dreck. I do not want to read crap. I do not want to see crummy movies with scenes I would rather forget. I listen to Schubert. I listen to Leonard Pennario. But I love to Zumba! I have been doing a lot of Zumba lately. And it is not as if you can Zumba to the songs of Heinrich von Herzogenberg.